Men Briefly Explained, by Tim Jones (Interactive Press, Australia), 74 pp. $27.99; Leaving my arms free to fly around you, by Nicola Easthope (Steele Roberts, Wellington), 68 pp., $19.99. That cover may be a canny acknowledgement of the insatiable appetite for New Age gender-wars books – those by relationship guru John Gray (‘Ph.D.’) and his kind. Such books assume that there are men in this undifferentiated group over here, and, on the other side of this great divide, women in this undifferentiated group over there; the notion that one man may be as unlike another as he is unlike, say, an individual woman is a complexity they tend to overlook. Thankfully Jones’s poems have more respect for their readers, and for the sexes, than this. The poems begin in childhood, and end in old age, but this book isn’t just one man’s lyrical journey between the two. Other voices interject, other men are observed, and even the apparently autobiographical boyhood poems mingle a child’s watchfulness with a wry, adult understanding. On an assisted passage to New Zealand, for example, who is it who notes the passengers jostling for social position, ‘angling, in an understated way, / for a seat at the Captain’s table’? Surely not the boy who ‘roamed decks, became impertinent to sailors’, but perhaps the man that boy became. Tim Jones casts a satirical but not unkind eye over his fellow men, and presumably himself – men who grew up in the seventies, who lacked their fathers’ number-eight-wire sensibility but could name the current and ex-members of obscure rock bands. Masculinity defines and redefines itself in these poems, which at their weakest don’t develop beyond their premises: a nostalgic observer, for instance, of the rampant, geeky consumerism at a sci-fi convention (‘In my day, / there was less money to be parted from’), or ‘Baxter-Curnow Band Live at Hyde Park 1969’, where it’s all there in the title. The best poems abandon that kind of playfulness in favour of the bleak insight that comes with age – poems of men who haven’t lived the lives they wished for, who have settled for less, have made do: ‘Retired, he had his garden, / books, the heavy ticking // of the farewell clock.’ There’s a Larkinesque kind of resignation there, not least in the foreshadowing of death, but such men remain resilient, resourceful: the same poem ends with its subject searching ‘tide tables, shipping movements, // looking for a sailing time, / a vessel heading home.’ The final poems are, appropriately, elegies, both for individual men and for obsolete (yet still embraced) modes of masculinity. The men implied here are limited in their variety – heterosexual, middle-class, and white – but within its chosen scope this collection focuses sharply and sympathetically on these men, even if it doesn’t quite explain them. 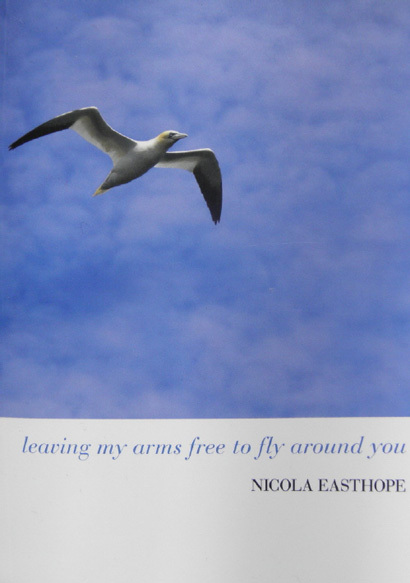 Nicola Easthope’s first collection of poems, Leaving my arms free to fly around you, is also slightly let down by its cover – a gannet flying against a mottled blue backdrop of sky. It’s a generic image of individuality and freedom, apotheosized in Richard Bach’s Jonathan Livingston Seagull. But it’s not just a metaphor: seabirds – gulls, gannets, shags, oystercatchers – are observed in these poems, with an eye to a human significance, sure, but also for the joy of really looking. Thus when oystercatchers are seen to ‘stoop – / tired old men in suits’, the identification is there to help us see these birds as the speaker does; the metaphor is a means to that end. These are the honoured traditions of the ode, the sweetness and instruction that are the dividends of close observation. I’m increasingly impatient with poems that tilt towards instruction: poems whose default mode is ecstatic, constantly finding in nature lessons to help us lead our lives more richly. I suspect Nicola Easthope is, too: at any rate, it is the intrinsic pleasures of attention that make the best of these poems so rewarding. To distil meaning from the object of the poems’ focus is secondary to this attention. The book is divided into three sections dealing, in turn, with travel, career, and family – in sum, the rites of adulthood. Some of the experiences represented here are familiar: in ‘The Spanish Vagrant’, for example, we recognise the busker who is always in the same place, only to vanish one day, never to be seen again. What lifts the poem beyond the familiar is the surprising language – the rapid-fire, vivid metaphors and deft rhymes that suggest the influence of Yorkshire poet Simon Armitage (and behind Armitage, another Yorkshire poet, Ted Hughes). It’s a fine poem, one that demonstrates Easthope’s technical skill. A few poems are less successful at assimilating their influences: ‘Ten ways of looking at Saturn’, for example, a riff on Stevens, smacks a bit of the poetry workshop. That is, it’s a well-wrought turn, an exercise, an admirable performance adroitly done yet which doesn’t quite justify the doing. This is a minor criticism of what is, in the parlance, an assured debut. TIM UPPERTON‘s first collection of poems, A House On Fire (Steele Roberts) was published in 2009. His poems have recently appeared in Best of the Best New Zealand Poems (Victoria University Press, 2011), Villanelles (Everyman, 2012), New Zealand Listener, and Best New Zealand Poems 2011.